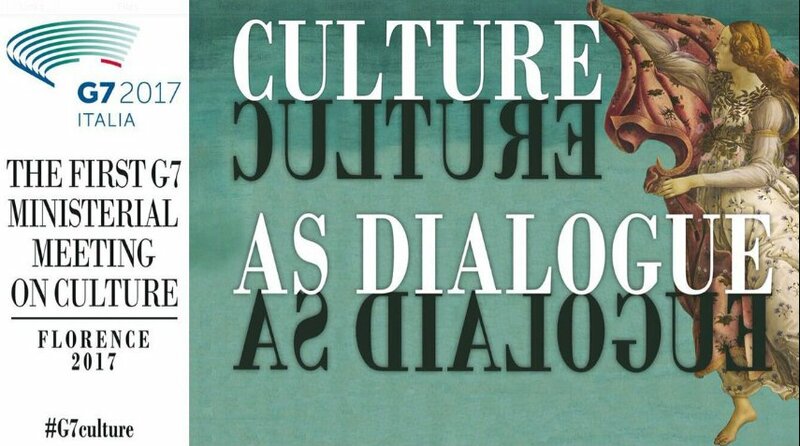 Preface: The Joint declaration of the ministers of culture of G7 on the occasion of the meeting “Culture as an instrument for dialogue among peoples” (2017) was adopted by the first G7 Culture Ministers’ meeting, Florence, Italy, 30-31 March, 2017. 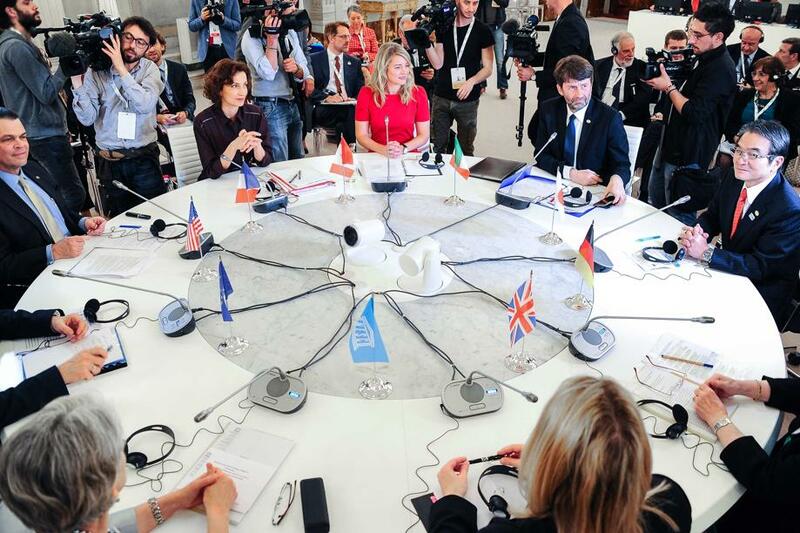 UNESCO Director-General, Irina Bokova, participated in the first ever G7 Culture Ministers’ meeting held on 30 and 31 of March in Florence, Italy. This event gathering representatives from Canada, France, Germany, Italy, Japan, the United Kingdom and the United States is held under the theme “Culture as a Tool for Dialogue among Peoples”. The protection of cultural heritage in crisis areas and the fight against illicit trafficking of works of art are the priorities of the G7 Ministerial meeting on Culture. The first ministerial meeting on Culture ended with the signing of the Joint declaration of the ministers of culture of G7 on the occasion of the meeting “Culture as an instrument for dialogue among peoples” (hereinafter referred to as “the Joint declaration”), condemning the destruction of cultural sites and calling upon the international community to intensify their fight against the illegal trafficking of cultural goods. It is up to the international community to protect archaeological sites, monuments, works of art, libraries and archive heritage in war zones. The Joint declaration follows Resolution 2347 on the protection of world heritage, unanimously approved by the UN Security Council. The Declaration was signed in the Sala Bianca of Palazzo Pitti in Florence by Ministers and other Culture representatives from the G7 countries: Dario Franceschini (Italy), David Bruce Wharton (USA), Karen Anne Bradley (UK), Maria Bhömer (Germany ), Audrey Azoulay (France), Mélanie Joly (Canada) and Ryohei Myata (Japan). The European Commissioner of Culture Tibor Navracsis and UNESCO Director-General Irina Bokova attended the ceremony as well. The Florence Declaration , also adopted by the G7 Culture Ministers, expresses strong support for UNESCO’s role in promoting the protection and preservation of cultural heritage and welcomed measures already taken to counter violent extremism and raise awareness, such as the #Unite4Heritage campaign. It also affirmed the leadership role of UNESCO in coordination of international efforts within its mandate to protect cultural heritage, working closely with Member States and relevant international organizations. Held in the wake of the historic adoption of the UN Security Council Resolution 2347/2017 on the Protection of Cultural Heritage in the event of Armed Conflict, this meeting is an opportunity to reiterate that defending culture is inseparable from the protection of human lives. Dedicated to the protection of cultural heritage, and the prevention of illicit trafficking, this meeting also aims at bringing to the global attention the power of culture as a driver for integration, peace building and sustainable development. “I would like to thank Italy for its tireless efforts to raise awareness on the destruction of cultural heritage among the international community,” said the Director-General of UNESCO. “In the times we live in, we need to drastically strengthen international coordination in the field of culture”, said Mr Dario Franceschini, Italian Minister of Cultural Heritage and Activities and Tourism and host of this G7 meeting, highlighting the role of creative industries to foster economic growth and the importance of intercultural understanding to combat mistrust, hatred and prevent conflicts. 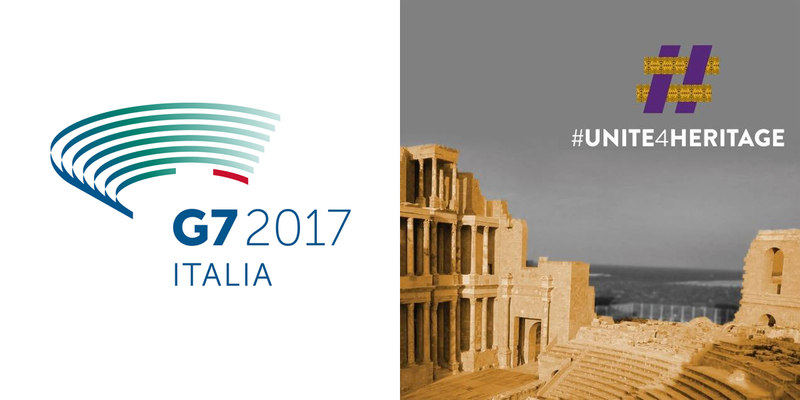 The G7 meeting also showcases the campaign #Unite4Heritage, UNESCO’s a global movement that aims to celebrate and safeguard cultural heritage and diversity around the world. The Director-General first launched #Unite4Heritage campaign in 2015 in Baghdad by UNESCO to exhort Member States to take initiatives to enhance and protect the cultural heritage – preserving it from damages in war zones – and to educate young people worldwide to promote culture as a tool for integration, growth, and sustainable development, in response to the unprecedented attacks on heritage. UNESCO and Italy then launched the “Task Force Unite4heritage” to intervene in emergency situations, to secure cultural heritage and counter illegal trafficking. Created as a movement to protect and safeguard heritage under threat, the initiative has turned into a global call to reclaim the importance of heritage as a platform to promote mutual understanding and as a tool to fight violent extremism. 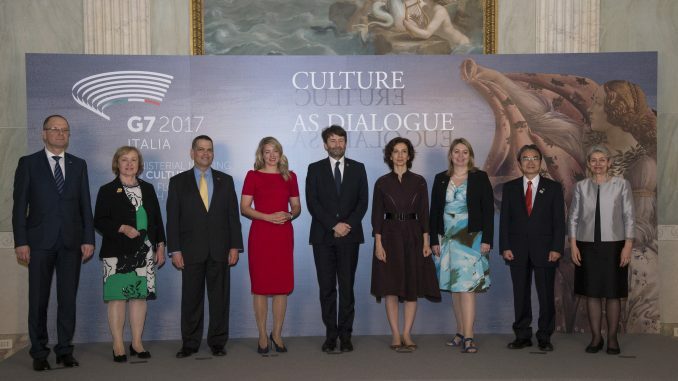 As part of #Unite4Heritage, Italy has launched a proposal to establish a task force to protect the world’s artistic heritage. In February 2016 a memorandum between the Italian Foreign Ministry and UNESCO has established the so-called “blue helmets of Culture”, a rapid response team with highly qualified staff composed of members of Carabinieri’s Cultural Heritage Protection Unit, art historians, scholars and restorers. Their function is to assess the risks and quantify the damage to cultural heritage, develop action plans and urgent measures, supervise technical training for local national staff, provide assistance to the transfer of goods in safe shelters and strengthen the fight against looting and illicit trafficking of cultural goods. UNESCO experts also joined the G7 technical sessions, focused on international regulations, procedures, and education models aimed at the protection of cultural heritage. Francesco Bandarin, UNESCO Assistant Director-General for Culture, stressed the legal and practical framework of UNESCO’s Culture Conventions in the context of public and private law, as well as the role of national and international courts, underscoring the 2016 ruling by the International Criminal Court against Al-Mahdi for the destruction of mausoleums in Timbuktu. He said it was imperative to unify the international legal framework and increase the ratifications of the international treaties. A few days ago, on the eve of the Florence ministerial meeting, the UN Security Council unanimously passed Resolution 2347 presented by Italy and France on the protection of cultural heritage during conflicts. The resolution condemns the destruction and looting of archaeological sites, museums, archives, libraries and the trafficking in cultural goods financing international terrorism. It also welcomes the proposal to provide, when requested, a cultural component within the UN peacekeeping missions. All issues that these days will be addressed by the G7 Culture as well. New York, 24 March 2017 – UNESCO Director-General Irina Bokova addressed today’s public briefing of the United Nations Security Council on “Maintenance of international peace and security: destruction and trafficking of cultural heritage by terrorist groups and in situations of armed conflict,” where the UN Security Council unanimously adopted resolution 2347 for the protection of heritage. UNESCO Director-General Irina Bokova addressed public briefing of the United Nations Security Council on “Maintenance of international peace and security: destruction and trafficking of cultural heritage by terrorist groups and in situations of armed conflict,” where the UN Security Council unanimously adopted resolution 2347 (2017) for the protection of heritage, New York, 24 March 2017. “The deliberate destruction of heritage is a war crime, it has become a tactic of war to tear societies over the long term, in a strategy of cultural cleansing. 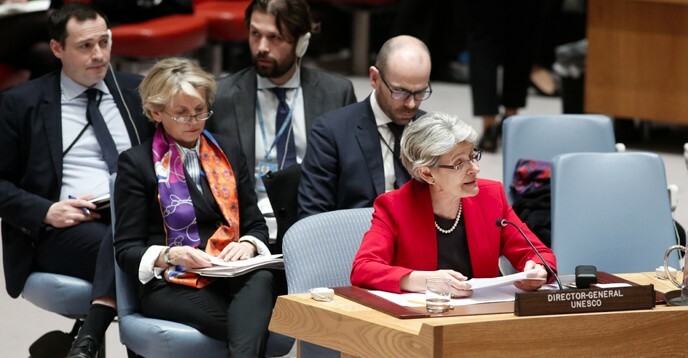 This is why defending cultural heritage is more than a cultural issue, it is a security imperative, inseparable from that of defending human lives,” Director-General Bokova told the Security Council, as she spoke in support of the resolution, with Executive Director of UNODC Youri Fedotov and Commander Fabrizio Parrulli of the Carabinieri Italiani. “Weapons are not enough to defeat violent extremism. Building peace requires culture also; it requires education, prevention, and the transmission of heritage. This is the message of this historic resolution,” she added. The briefing by Director-General Bokova before the Security Council marked the first time a Director-General of UNESCO has been invited in this capacity. The briefing was held at the initiative of France and Italy and under the Presidency of the United Kingdom. The Director-General went on to explain that since the adoption of UN Security Council Resolution 2199 in 2015, which prohibits trade in cultural property from Iraq and Syria, efforts are well-underway to disrupt terrorist financing through the illicit trafficking of antiquities. “In a global movement launched by UNESCO, some 50 States have strengthened their legislation and are sharing information and data, to dismantle trafficking routes, to facilitate restitutions. “Together, UNESCO, INTERPOL, the United Nations Office on Drugs and Crime, customs services, the private sector and museums are all bolstering cooperation, coordinating new action,” she said. Commander Fabrizio Parulli of the Carabinieri Italiani and the Unite4heritage task force shared the latest data on illicit trafficking, recalling that over 800,000 artefacts have been seized since 1969 by Italian forces in the fight against the financing of criminal activities. Resolution 2347 is the first ever resolution adopted by the Security Council to focus on Cultural heritage. The unanimous support to the Resolution reflects a new recognition of the importance of heritage protection for peace and security. UNESCO is guardian of a wide array of legal instruments that are of vital importance in the protection of cultural heritage. These include the Hague Convention for the Protection of Cultural Property on the Event of Armed Conflict (1954) and its two Protocols, as well as the 1970 UNESCO Convention on the Means of Prohibiting the Preventing the Illicit Import, Export and Transfer of Ownership of Cultural Property and the Convention concerning the Protection of the World Cultural and Natural Heritage (1972). The first G7 Culture Ministers’ meeting, Florence, Italy, 30-31 March, 2017. The Joint declaration expresses strong support for UNESCO’s role in promoting the protection and preservation of cultural heritage and welcomed measures already taken to counter violent extremism and raise awareness, such as the #Unite4Heritage campaign. The Joint declaration affirmed the leadership role of UNESCO in coordination of international efforts within its mandate to protect cultural heritage, working closely with Member States and relevant international organizations. The Joint declaration recalls the UN Security Council Resolution 2347/2017 on the Protection of Cultural Heritage in the event of Armed Conflict, and reiterates that defending culture is inseparable from the protection of human lives. The Joint declaration underscores the protection of cultural heritage, and the prevention of illicit trafficking, and aims at bringing to the global attention the power of culture as a driver for integration, peace building and sustainable development.